It is speakers just like you that allow us to run our conference every year. Over 120 delegates from across Ontario come to Kingston to hear about your real life experiences and learn from your successes. If you are interested, reach out to a member of our sponsorship team for more information. As an industry leader and experienced business professional sharing your journey and expertise will contribute great value to our delegates. Delegates are eager to learn from your stories and words of advice. On the second day of the conference, we host 5 panelists each representing a different industry for a 2 hour panel discussion to help guide students still unsure about their careers. 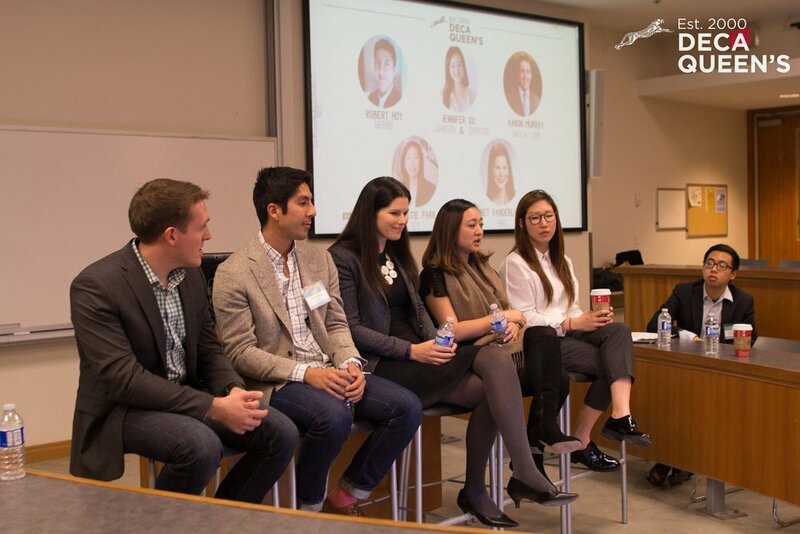 In the past, panelists have been from Google, Capital One, Johnson and Johnson and EY. Judges are truly the foundation of our conference. Without them, we would not be able to run our unique style of case competition. Judges are responsible for assessing delegate presentations in an interview setting using specific and directed questions in order to critique the delegate's proposal.